Six String Loaded. A female-fronted rock band from Edmonton, Alberta. Vocalist Naomi Carmack has been recording music most of her life. At age 14, she won local radio station Power 92.5 FM’s “Powermix” contest, and her her first single “Be My Baby”, released to the masses. The project was produced by Pirate Radio DJ Chris Sheppard, and was the first stepping stone in her career. She went on to receive a nomination for “Best Dance/Rap/Rhythm Artist” that year from the Alberta Recording Industry Association. Although she started her musical journey in pop music, her passion has always been rock music. Naomi wrote and recorded a solo album in 2003, and went out looking for the band she would eventually perform those songs with. Naomi is noted as having a sultry, raspy, and powerful voice, unlike any. What was originally a backing band for her solo career, turned into a three piece with a name – Six String Loaded. Over the last ten years, SSL has played the top live venues in and around Edmonton, including Rexall Place, once Edmonton’s largest venue and previous home to the Oilers, for the Oil Kings, which has always been a huge dream for the band members. SSL opened for Canadian rock icons Trooper in 2016. In creating a new incarnation of the band, Naomi got together with one of Edmonton’s best young guitar talents – Matt McCotter. McCotter has a ton of live and writing experience at a young age. He has worked with big Edmonton talent, and is an exceptional songwriter. 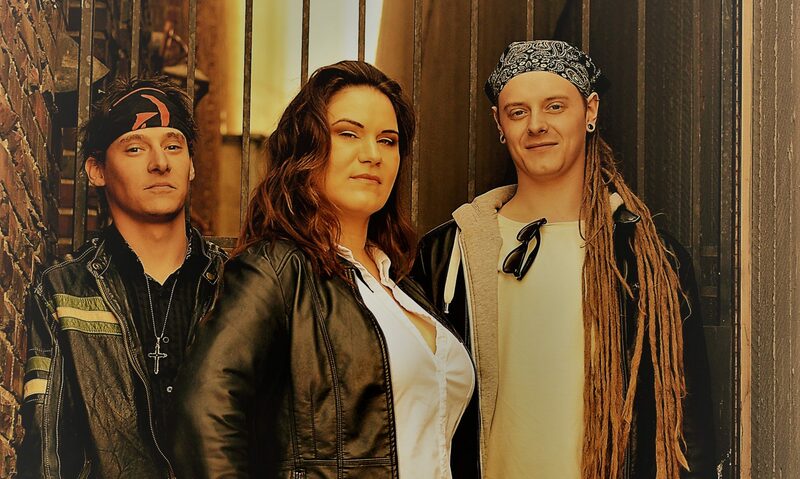 With fresh blood and new concepts in songwriting, Matt and Naomi recorded the single “The Last Song I Ever Write” with one of the hottest Canadian rock bands around – The Veer Union’s Crispin Earl on production. The rhythmic backbone of the band is Brandon Reddecliff. Raised in Bonnyville, Alberta, Brandon has also shared the stage with many notable acts in Edmonton, including Soundscape and Self Evolution. Brandon studied audio engineering in Vancouver, and the multitalent has played different instruments other than the drums throughout his career. The most recent singles released, “Memphis” and “The Web We Weave”, are produced by esteemed Edmonton musicmaker Stew Kirkwood. They have been played on Edmonton radio stations 95.7 Cruz FM, CJSR 88.5 FM, and 102.3 Now! Radio. The band went to New York City to perform on a radio show called “The Real Radio Show”. Six String Loaded is now booking shows everywhere.